Been pretty busy lately, work and Oregonians visiting, barbecues and swim contests, and frankly not a lot of great cooking on my part. But I'm refocused, motivated primarily by a shocking number of credit card charges for dinners out. Time to get back in the kitchen. It's not fall yet, but it is hatch pepper time. 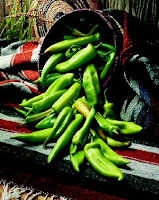 Hatch chiles can be mild or hot, but are only meant to be eaten after their skin is roasted off. I learned a lot of new recipes from Taste Tester's family involving hatches, and we invented a few of our own as well, but this simple pesto is my absolute favorite. Tomorrow I plan to buy a huge pile of peppers and make enough of this to last us through fall. The first 3 ingredients go in the blender; then olive oil is poured in slowly until it reaches a hummus-type consistency. I don't think you need the parmesan but it's pretty yummy when not dieting. This is the family version, but Central Market made a milder, oilier version I didn't enjoy as much. It's not for the weak-hearted, but if you like spice, it tasted good smeared on everything from roasted corn to barbecue, and I even used a dallop in soup today.